“Fra queste mura allievi e maestri ebrei italiani espulsi dalle scuole pubbliche dalle leggi razziali del 1938 trovarono accoglienza e crearono una scuola di eccezionale livello culturale e umano” (“Within these walls, Italian Jewish students and teachers, expelled from public schools by the racial laws of 1938, found a shelter and created a school of exceptional cultural and human level”), reads the plaque located at the entrance of the garden surrounding the Notre Dame Villa in Rome. The commemorative plaque was placed on November 24, 2008, 70 years after Italian racial laws during Fascism were promulgated. During the meeting of the Gran Consiglio del Fascismo, which took place on the night between 6 and 7 October 1938 in Rome, racial laws were approved. The laws prohibited Jews from having any professional occupation, sexual relations or marriages with Italians, employing non-Jewish Italian domestics, serving in the military and attending all educational institutions. The Fascist government declared that Jewish children would not be allowed to attend public schools, so that Aryan children would not be contaminated. It was permitted, however, to establish some primary and secondary schools for Jewish children under the control of an Aryan commissioner, nominated by the Ministry of Public Education. In Rome, primary and secondary schools were instituted in less than two months. A committee of parents found the building in Via Celimontana, which now hosts the ND Villa, and gathered the money to purchase the necessary equipment and obtained the appointment of Nicola Cimmino, an Italian and Aryan dean. 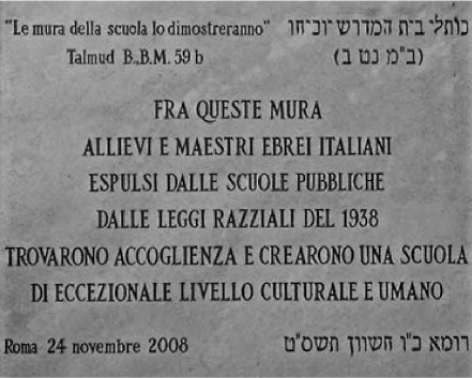 On 23 November 1938 the Jewish school opened its gates to four different institutions: middle and high schools, “scuole magistrali inferiori e superiori”, and technical institutes. A total of 411 students, divided in 29 classes, attended the school during morning and evening shifts. At the time the school opened, Giacometta Limentani was an 11-year-old child. On 23 November 1938, she moved to the Jewish school in Via Celimontana to attend her second year of middle school. Unlike other children her age, she already had experienced hardship. Her father was an anti-Fascist often taken from home, work, or the streets to be tortured and questioned. When Fascist soldiers returned him to his home, they would throw him on the floor as if he were garbage. Once, when she was eleven, four young Fascists came looking for her father, but he wasn’t there. Instead they found only Giacometta and her old, sick grandmother suffering from cataracts. They asked the little girl where her father was; when they weren’t happy with the answer they resorted to violence. 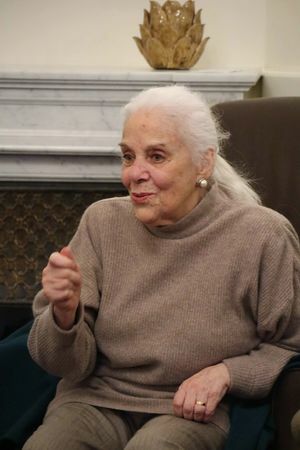 Many years later, Giacometta described the extreme violence she experienced and how, as a result, she was not a typical child when she arrived at the school in Via Celimontana in 1938. Giacometta was invited to visit the old Jewish School as it is today to meet and talk with the ND students studying abroad in Rome. Her testimony detailed what she experienced and also relayed her joyful years in the same building that protected her and many other students from the outside world. 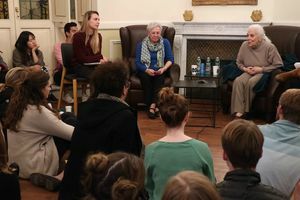 In the living room of the Villa, students sat down, legs crossed, and listened to Giacometta and her friend, Paola Fano Modigliani, the daughter of a Jewish family who survived the Second World War, share their memories. “What happened after October 1943, after the Nazis came to arrest 1022 Jews and deport them to the network of labor and extermination camps of Auschwitz-Birkenau?” asked a student. “And what happened when the war ended?” another student asked. Giacometta left the ND Villa with a smile on her face, happy to have met such a lively and interested group of students in Rome. She was also grateful to have been given the chance of stepping again inside the building that set her free from a hostile outside world. It is as if a circle now finally closes as the building goes back to its origins and turns, once again, into a school. It is restored into a place where students have the freedom to learn, explore their passions, raise questions, but most of all, a place where students will learn from the past in order to avoid repeating. Originally published by Costanza Montanari at international.nd.edu on December 15, 2017.